As Southern Michigan’s complete resource for commercial office services, including moving, installations, warehouse storage and distribution, we offer an extensive inventory of new and used office furniture. Clients representing a wide range of industries look to us as premier resource for either refurbished inventory or new systems for their office facilities. Over the years, we’ve customized these solutions to literally thousands of clients representing numerous industries. It’s this accumulated experience that has given us a wide span of knowledge of an abundance of office furniture systems and equipment. As a result, we are intimately familiar with the intricacies, and performance of various furniture brands. This familiarity allows us to recommend a customized office furniture solution to meet the unique needs of your business. We provide both new and used furniture and may suggest a combination of both to align with your budget and design specifications . 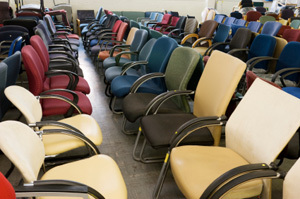 For businesses looking to purchase pre-owned equipment, refurbished and reupholstered furniture can be a cost effective option. Other organizations who wish to make purchasing decisions that align with corporate environmental sustainability initiatives, will find our refurbished furniture choices to be an excellent eco-conscious resource. Our extensive network of manufacturer relationships assures that you receive even the most customized order in the least amount of time. We provide turnkey service, handling the receiving, transportation and installation of your purchase. Additionally, as an authorized service provider we provide scheduled preventative maintenance as well as efficient on demand repair. We even offer space planning and design consultation so that you can make sure that the option you choose aligns with your office configuration and facilitates an efficient and productive workflow process. To find out more about our new and used office furniture sales please contact us by phone or fill in the form on the page.